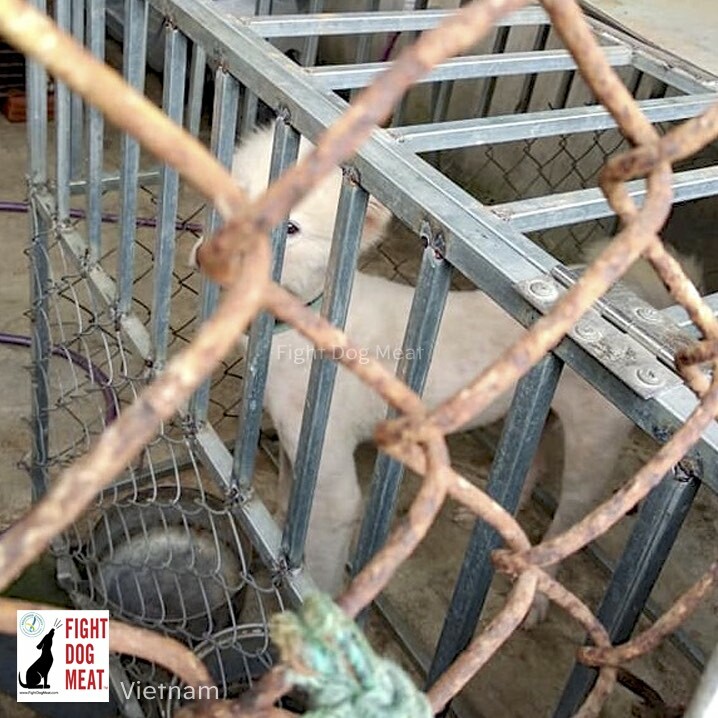 A young animal lover in Da Nang took a brave step and went to look at the local slaughterhouse holding cells in her town. She was too nervous to go inside but looked through the fence and took photographs as evidence of what is happening there. She saw hundred of caged cats crying for help; crammed on top of each other. The cats were being held for a transport truck to move them to Hanoi, for slaughter as cat meat. At the far end of the caged cats was a shaved Samoyed dog wearing a blue house collar. This dog was probably a once-loved stolen pet. 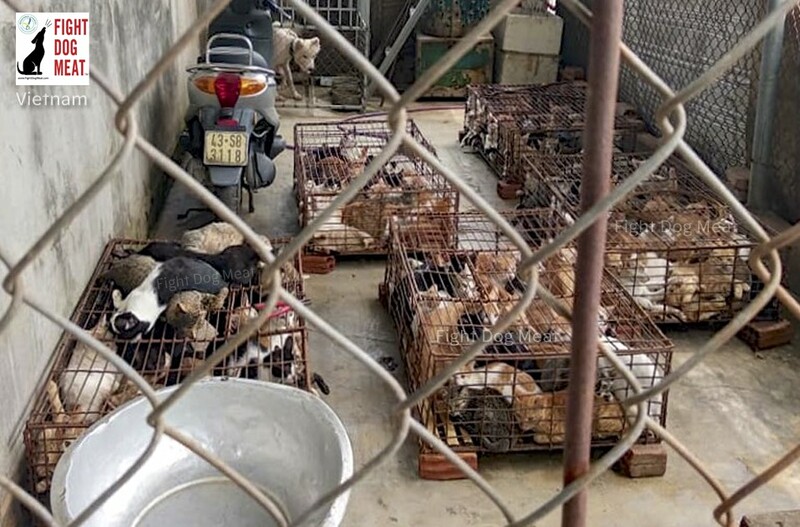 The animal lover found the sight of hundreds crying cats and terrified dog extremely distressing and intensely overwhelming. Shaved Samoyed dog wearing a blue collar. Probably a stolen pet. Da Nang is located in central Vietnam, close to Hoi An. It is one of Vietnam’s main tourist areas. Tour guides shield international tourists as much as possible from any vision of the dog and cat meat trade because they know tourists would be horrified. Years ago so many cats were eaten across Vietnam that cats were almost wiped out! Rodent populations exploded and farmer’s crops were decimated by plagues of rodents. It broke farmers and caused catastrophic damage to the economy. The Vietnamese government passed a law forbidding the slaughter and consumption of cats. However as cats reproduced and the next crop of rice and other crops were planted and harvested, the new law forbidding slaughter and eating of cat meat was ignored. Cat meat is mainly eaten out of superstition in Vietnam. It is falsely believed that if you eat cat meat at the start of each month it will ward off evil for that month. For cat eaters this has to be repeated at the start of every month. There is no scientific proof about this at all. 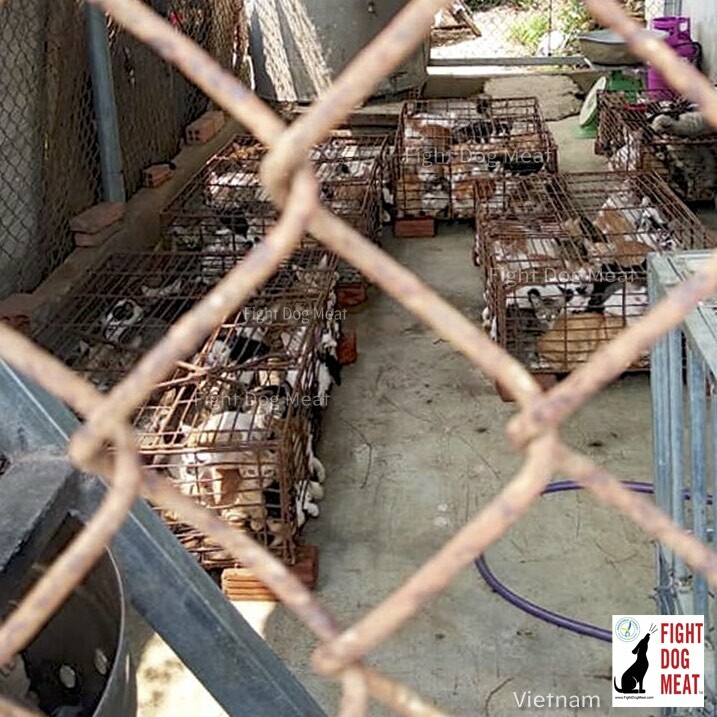 Cat holding area; some for slaughter on the premises and some to be shipped to Hanoi for slaughter for cat meat. It was brave of this young woman to go to the slaughterhouse. It is people like her who the Vietnamese Government will ultimately listen to, to bring in animal protection laws and end the trade. A few weeks ago Hanoi’s city government announced a projected ban of all dog and cat meat in Hanoi and surrounding areas to be in place by 2021. They cited the negative effect the trade has on international tourists and the ongoing outrage against the trade by the international community on social media platforms such s Facebook. This shows the Vietnamese Government is hearing our collective voice around the world and noting that collectively we support Vietnam’s animals lovers who desperately want the trade ended! We are thankful to the government of Hanoi for this important step forward. We look forward to the day the ban in implemented and enforced.